On 1 March 2019 the English court granted the claimant, ACT, a permanent anti-suit injunction against proceedings issued in Jordan (the Jordanian Proceedings) by the defendant, Soletanche (in Aqaba Container Terminal (PVT) Co v Soletanche Bachy France SAS). The Court found that the subject matter of the Jordanian proceedings fell within the scope of an arbitration clause agreed between ACT and Soletanche. Soletanche had relied in the validity of that arbitration clause in earlier ICC proceedings to claim damages from ACT (albeit unsuccessfully). It was therefore just in all the circumstances to issue an anti-suit injunction to prevent breach by Soletanche of the agreement to arbitrate and to halt its efforts to invalidate that agreement through the Jordanian Proceedings. 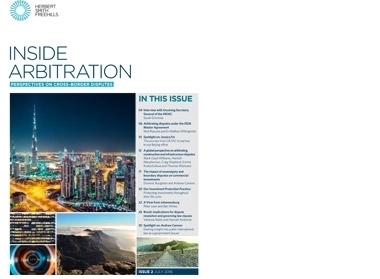 We are delighted to share with you the inaugural issue of the new publication from the Herbert Smith Freehills Global Construction and Infrastructure Disputes Practice. Inside Construction and Infra showcases the expertise of our leading construction and infrastructure disputes lawyers, giving our clients the benefit of their experience drawn from cases taking place around the world. The publication offers fresh perspectives on this rapidly changing industry, identifying current market trends and providing personal insights from our practitioners across the globe. Click here to access issue #1 of Inside Construction and Infra. In this article, Elizabeth Kantor and Philip Parrott consider the reasons why parties may wish to include multi-tiered dispute resolution clauses in their construction contracts and warn of common pitfalls which can cause the unwary party to become embroiled in time-consuming and costly procedural battles. This article was first published in Construction Law on 9 August 2016.